The museum has a set of medals belonging to H J (Harold) Beer. However, one of the medals – the British War Medal – instead of being stamped on the rim with H J Beer, is stamped ‘H J BASTRICK’. Who was H J Bastrick and why was his medal mounted together with those of H J Beer? An interesting question but not one we’ve had the time to unravel in the past. However, a recent email brought the mystery back to light and turned our collections staff into detectives! It turned out a gentleman in the UK (who spotted our medals database entry for H J Beer) had a set of medals stamped with H J Bastick except for – you guessed it – the British War Medal which is stamped with the name H J Beer. The two sets had obviously been mixed up, either when they were issued or when they were mounted. Interestingly, the Bastick medal mounted with the Beer medals had the recipient’s name incorrectly stamped (Bastrick instead of Bastick). 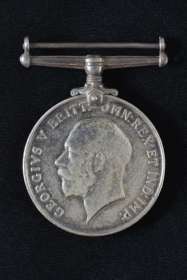 The UK based owner of the Bastick medals inherited them from friend, H J (John) Beer of Portsmouth; the museum’s medals also came from a John Beer who lived in Shrewsbury. Surely this was likely to be one and the same person? But how was he related to the medal recipient, Harold Beer (unfortunately this was not recorded on the original museum documentation)? Each bit of new information seemed to throw up more questions rather than answers. And, everyone was still in the dark about who H J Bastick was and what was his relationship, if any, with H J Beer. Time to don the deerstalker hat and do a bit of sleuthing! A search of births, deaths and marriages registers and Admiralty record archive listings, along with a closer look at other documents and photos donated to the museum with Beer’s medals, finally brought some clarity to the situation. Firstly, it was determined that the museum donor and the friend of the UK owner of the Bastick medals was the same person, H J J Beer, known as John. He was born in Portsmouth and lived there most of his life before moving to Shrewsbury (while retaining his Portsmouth flat). It was his father, Harold James Beer, whose medals are here at the Navy Museum. Harold Beer served in the Royal Navy in the First and Second World War. 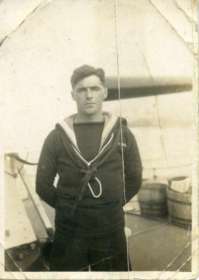 His service included a posting to HMS New Zealand and it is possible that this is the reason his son, who visited New Zealand, donated the medals to the museum which has a significant collection of HMS New Zealand artefacts. And the connection to the Bastick medals? Harold Beer’s wife – John Beer’s mother – was Irene May Bastick, daughter of H J (Henry Joseph) Bastick. No doubt, John Beer eventually ended up in possession of both his father’s and his maternal grandfather’s medals. Perhaps they were unmounted at this point so he undertook to get them mounted, only for the two British War Medals to get mixed up at some point. The happy ending to this story is that the owner of the Bastick medals kindly agreed to donate the errant medal to the museum so we can complete the set. A mystery solved, the identities of two HJB’s revealed and a medal set reunited – all in a day’s work for the museum collection team.